Manchester United’s Premier League clash with Fulham on Saturday possesses an added element of difficulty due to the spectre of Paris Saint Germain’s visit to Old Trafford days later. That is true, in theory. In practice, though, when you are preparing for the game and then playing in it, nobody can fully shut off in their minds those three letters, three letters going through the minds of every supporter: PSG. With that in mind, it could be prudent of Ole Gunnar Solskjaer to give opportunities to players who certainly will not be playing against PSG, without notably diminishing the strength of the team which plays Fulham. Alexis Sanchez and Romelu Lukaku are in no shape for a starting place against Thomas Tuchel’s team but certainly could make an impact against Fulham. They should look to Man United’s last visit to London, a 3-1 win over Arsenal at the Emirates, for inspiration. 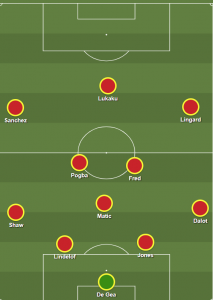 It feels like a good time to use Fred, who Solskjaer clearly doesn’t quite trust yet. Herrera, more than any other midfielder perhaps, must be kept fresh for what promises to be a high-intensity clash, with one of Paul Pogba or Nemanja Matic coming off at around 60 minutes.